(St. Louis, MO and Houston, TX – August 27, 2018) – Curium and RadioMedix Inc. announce an exclusive agreement to develop and commercialize 64Cu-Dotatate, an investigational positron emission tomography (PET) diagnostic agent for patients with suspected Neuroendocrine Tumors (NETs). RadioMedix is currently engaged in Phase III clinical trials of the agent and expects to file a New Drug Application with the Food and Drug Administration in 2019. 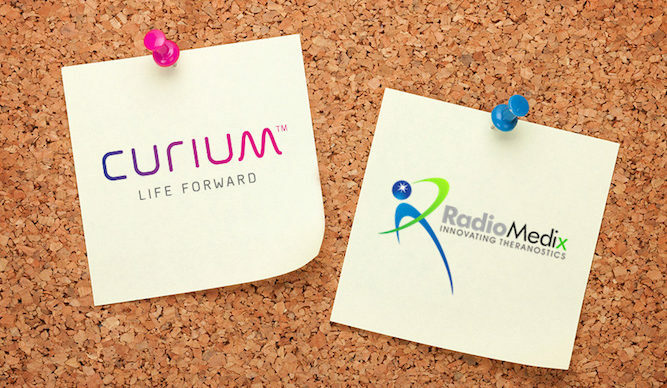 This partnership builds on the initial development work conducted by RadioMedix and will benefit from Curium’s regulatory, manufacturing, distribution, and commercial expertise. Neuroendocrine tumors (NETs) are a heterogeneous group of rare neoplasms that originate from neuroendocrine cells. These neoplasms occur mostly in the gastrointestinal tract and pancreas, but can also occur in other tissues including thymus, lung, and other uncommon sites such as ovaries, heart and prostate. Most NETs strongly express somatostatin receptors (SSTRs). With manufacturing facilities across Europe and the United States, Curium supports over 14 million patients around the world with SPECT, PET, and therapeutic radiopharmaceuticals. The Curium brand name is inspired by the work of radiation researchers Marie and Pierre Curie and emphasizes a focus on nuclear medicine. To learn more, visit curiumpharma.com. RadioMedix, Inc. is a clinical stage biotechnology company, based in Houston, Texas, focused on innovative targeted radiopharmaceuticals for diagnosis, monitoring, and therapy of cancer. The company is commercializing radiopharmaceuticals for PET imaging and therapeutic (alpha and beta-labeled) radiopharmaceuticals for targeted radionuclide therapy in cancer. RadioMedix has also established two service facilities for academic and industrial partners: cGMP Manufacturing Suite for human clinical trials and probe development and small animal Molecular Imaging Facility for pre-clinical evaluation of radiopharmaceuticals in animal models. More information at www.radiomedix.com.